Momentum is the word that best describes where we are as a winery, and characterizes the 2017 vintage perfectly. Coming off the heels of the stellar 2015 and 2016 vintages where the quality of our wines reached new heights, and the world seemed to be paying close attention, we knew that we needed to carry this energy through to the 2017 wines. Now here we are, still rolling full speed ahead, ready to release our newest vintage. These wines are alive; uncork a bottle and you’ll feel it. 2017 was our second vintage working in the new winery. The pleasure in having our own space to work cannot be overstated. The flow and efficiency that we have in our simple structure is wonderful. 2017 also marked our seventh vintage. Of course, each year we aim to become better at the work we do, and it seems that though the 2017 vintage had its challenges, overall it was a great success. These wines represent joy, precision, and depth. We chose not to make Les Alliés Riesling or Les Alliés Pinot Noir this vintage, and de-classified our fruit in order to ensure the absolute best quality would remain in the Classique, our most important wine. 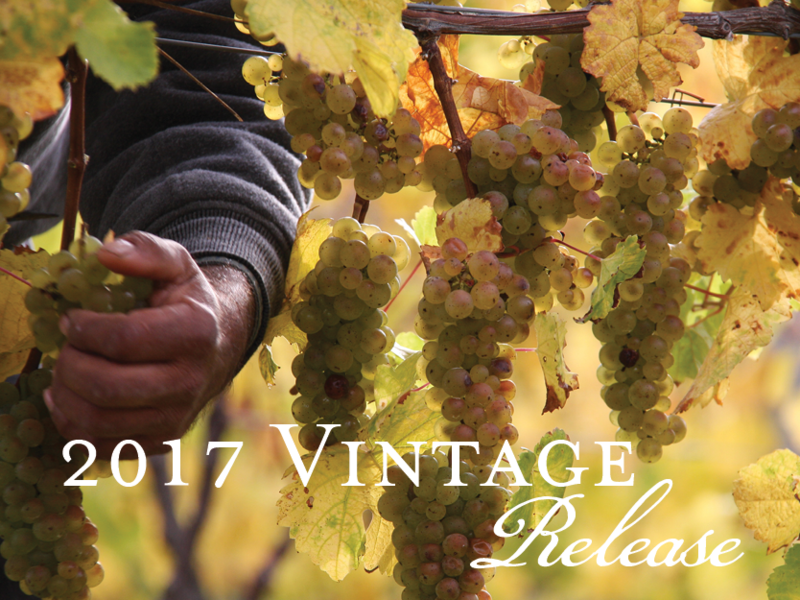 A portion of the 2017 vintage wines are now available online and at the winery, including our Dry Riesling Classique, and two new single vineyard Rieslings: Peach Orchard Vineyard and Breakneck Creek Vineyard. The remaining wines will be released throughout the summer and fall of this year. As always, thank you for coming along on this journey with us and for your steadfast support. We hope that you enjoy these wines as much as we do. Due to our focus on this narrow 8-mile stretch of slope on the southeast side which includes 13 of our 14 Riesling vineyards, this will be our first labeling under the Seneca Lake AVA. Our 2017 Classique was fermented and aged in neutral barriques (57%) and in stainless steel (43%). Candied lemon, apricot peel, Asian pear, and anise join with salinity to give impeccable freshness. Planted in a former hub of fruit tree production, this aptly named site is the most fruit-focused of our Rieslings. Robust and round, it gives notes of quince paste, stony minerals, dried herbs, tangerine, and juicy peaches. Our first year working with this site has already shown great promise. The dramatic landscape of Breakneck Creek—cliffs and waterfalls—carved from hard layers of shale echoes in the minerality of this wine. It is dense with flavors of tropical fruits, lemon tart, chamomile, and vanilla. One of our purist expressions of terroir on Seneca Lake, this mature shale-laden, “Grand Cru” site continues to merit a stand-alone bottling. Intensely focused, the 2017 yields notes of candied orange peel, mango and fresh mint. 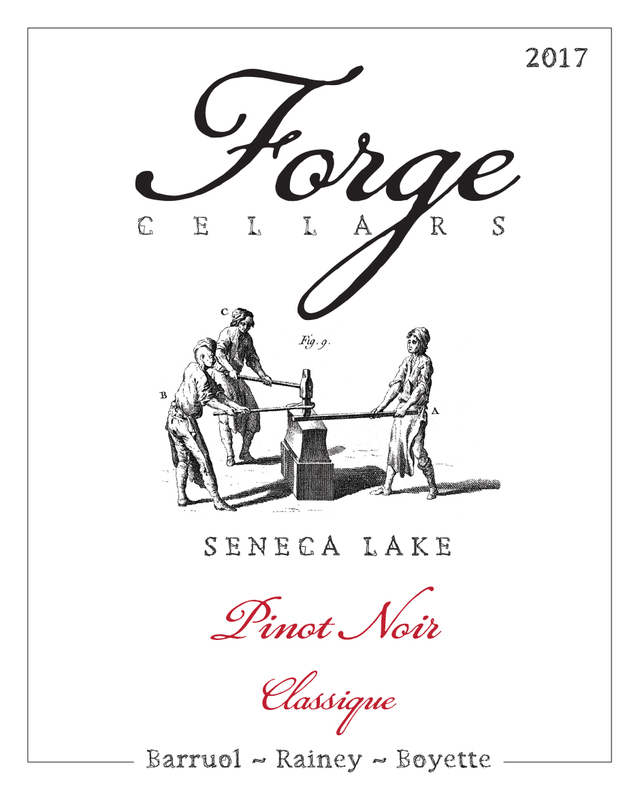 Hand-harvested fruit from our east Seneca Lake Pinot Noir vineyards were hand-sorted and partially (30%) whole-cluster pressed. Spontaneous fermentations with native yeasts were followed by additional barrel aging for ten months. Same style, different site. The 2017 is our first Rosé with Pinot Noir from Sawmill Creek Vineyard. After 24 hours, the juice was bled off of the skins using the saignée method, resulting in the structured, savory style of rosé that we enjoy. 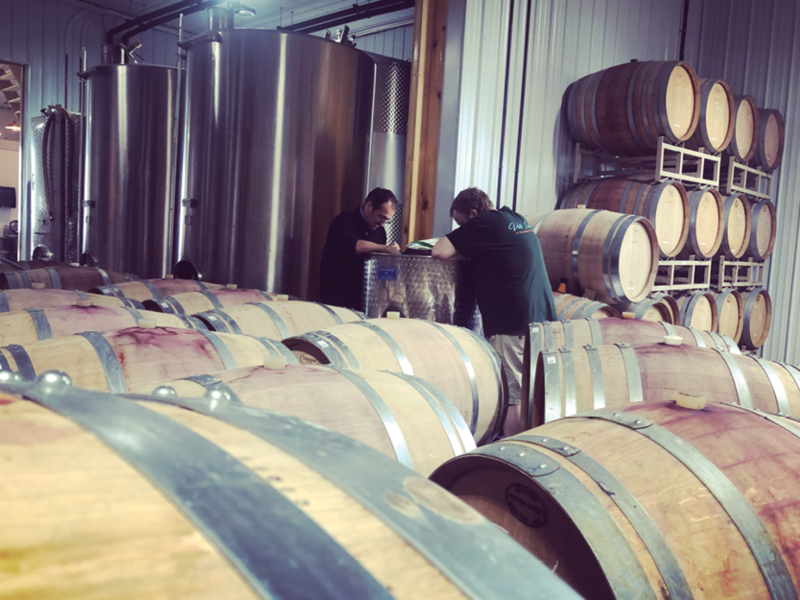 Here we are, in between the calmness of slow, steady fermentations and the thrill of preparing these barrels for the journey ahead. Using natural yeasts as we do, our wines take their sweet time to ferment to bone dryness and the 2017s are still finishing this evolution. 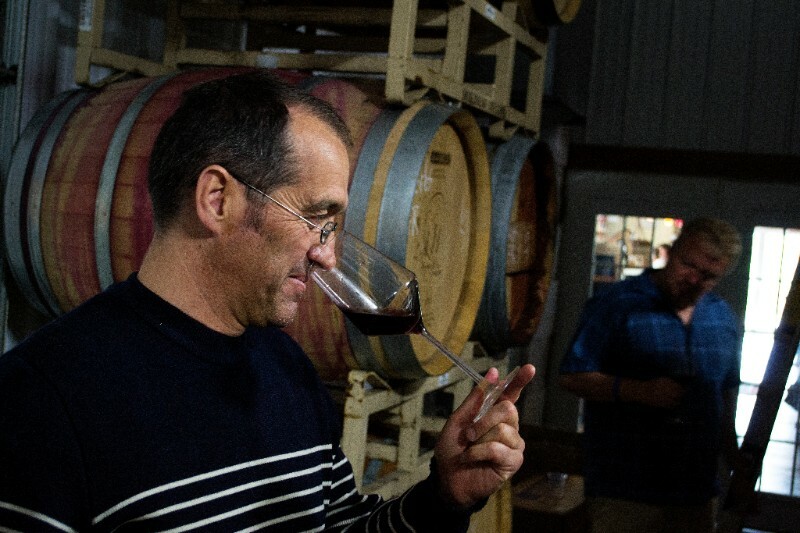 It’s a busy time of constant tasting and note-taking, discovering the vintage in our cellar. 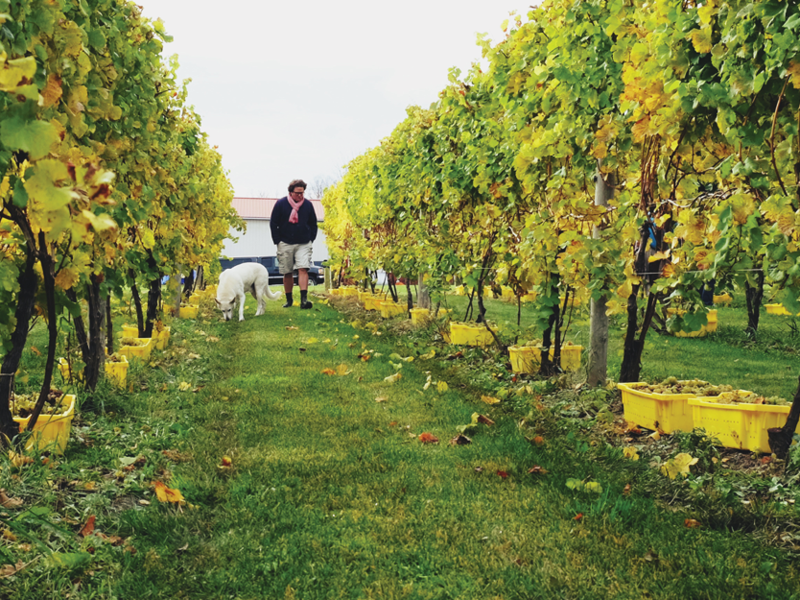 There is hardly anything more exciting than tasting through the wines from our collection of vineyard sites, and experiencing the “colors” of the eastern shore of Seneca Lake. 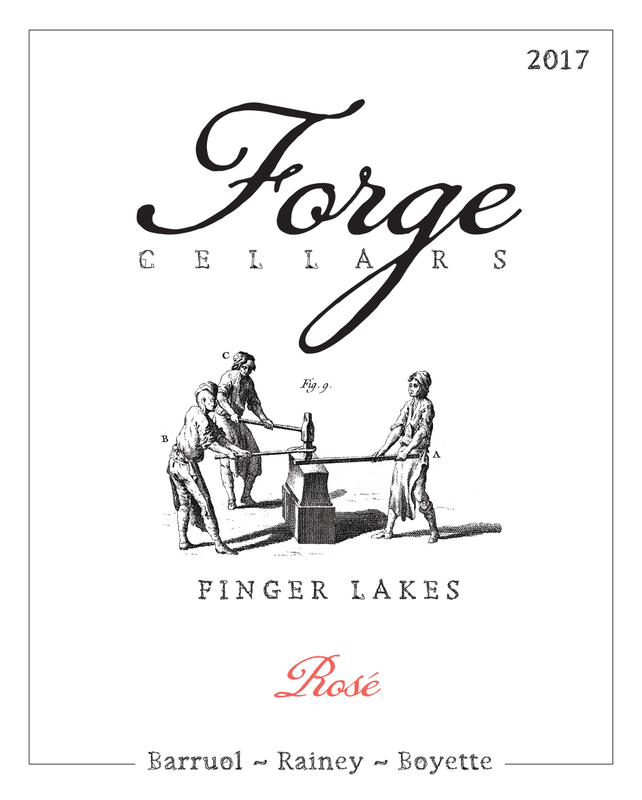 People often ask about our interest in working with so many sites; the simple and honest answer is that, at this young stage of Forge and the Finger Lakes, we want to explore our terroir more completely and partner with the best growers, while still focusing within a tight eight-mile strip that we love along southeast Seneca Lake. Keep in mind the narrow terroir that is in our Riesling Classique: even with 15 plots, we are essentially working with vineyards between Lodi and Hector, except for one late-harvest site. There are certain terroirs that offer intensity and precision, while other sites offer savory, stony minerality, or flavors that make you feel like you just bit into the juiciest peach of your life. Blending these profiles together allows us to give you a bottle that is layered with the complexity we find in the lower-east microclimate of Seneca. To define this connection, beginning with our 2017 vintage, our wines will be labeled with the "Seneca Lake" AVA rather than the wider-ranging "Finger Lakes." What about the single vineyard wines? There are always a few vineyards that so clearly portray their terroir that they compel us to study them alone. They are masked within a blend and brilliantly complete on their own. Similarly, we note a few barrels among both the Riesling and Pinot Noir that are truly exceptional, and can be nothing other than our Les Alliés. In these coming days, we will sit together as a team and uncover the 2017 vintage. More than one hundred barrels will be individually tasted, assessed, blended, and the final wines realized. On Thanksgiving day, two things are more important than the wine you pour. No. 1, of course, is the people you are with. (If you thought "watching football" was No. 1, you might need a re-education on the meaning of Thanksgiving; start with a "Charlie Brown" special.) No. "How many times have we walked away from meals talking more about what was in the glass than what was on the plate? Many times." We couldn't agree more with Michael Austin of the Chicago Tribune. Of course, the feast is centerpiece of Thanksgiving, but without wine, the feast is incomplete. In his article of must-have wines for Thanksgiving, Austin recommends our 2015 Dry Riesling Classique, calling it "full of minerality, almond, orange zest, citrus and a whisper of smoke — soft and luscious with bright acidity and a dry finish." One of the best things about the holiday season and the foods that accompany them is that our Riesling and Pinot Noir offerings were practically made for them. The Rieslings have weight and concentration with the perfect amount of freshness and acidity to complement rich dishes (poultry, pork, creamy squashes and soups) while also not overpowering the lighter fare at the table (salads and fresh vegetables or cheeses). Vegetarians or those with carnivorous cravings will take pleasure in pairing a variety of foods with our Pinot Noir. Our Pinots have unbelievable intensity with the perfect amount of restraint. Earth, mineral, and fruit are woven together with precision and intention, while the tannins and acid breathe structure and freshness into the palate. Poultry or red meat, root vegetables and mushrooms, lentils or salmon, and of course the traditional Thanksgiving cranberry sauce and stuffing -- these are just a few ways you can introduce Forge Pinot to the food and guests at your table. Our friend, Steve, from the Seattle area sent us this picture of our 2015 Lower Caywood Vineyard Riesling that he paired with local Dungeness Crab. This may be one of the greatest parings with that wine that I could ever imagine. The richness, minerality, and specifically the wild herb component of our Lower Caywood Riesling paired with the crab must have been wonderful. 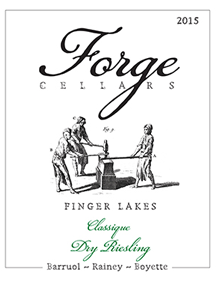 There is no wine club at Forge, no hierarchy among fans of great wine, no complicated sales gimmicks, just a simple formula for sharing what we do with those who enjoy it. Our annual offering keeps us engaged with you a few times a year without filling up your inbox. We would prefer that you read less emails and have more time to visit us in the Finger Lakes. 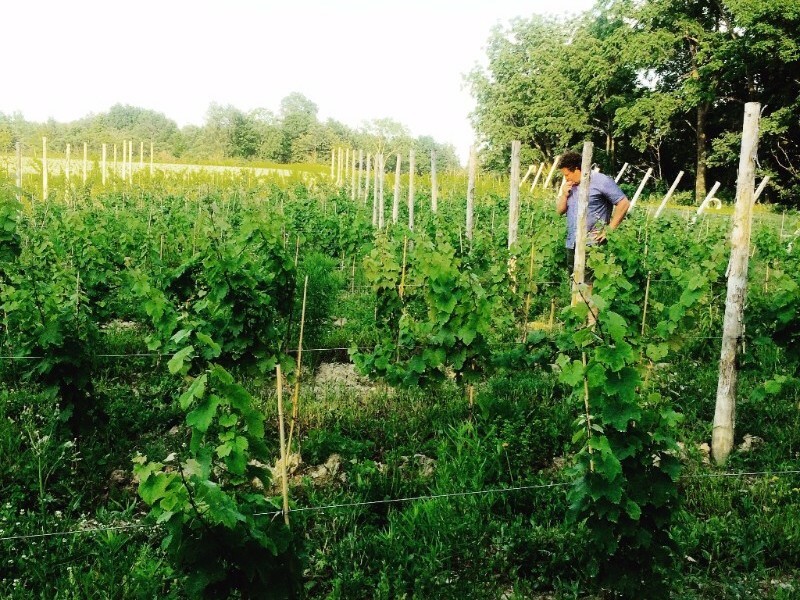 The 2015 vintage is very small in terms of quantities. The volumes, meaning the juice we received from the grapes, was to put it...mildly frightening. However, wines from 2015 are so much fun to drink that you'll quickly forget how little there is--until you finish the bottle and go to look for another. 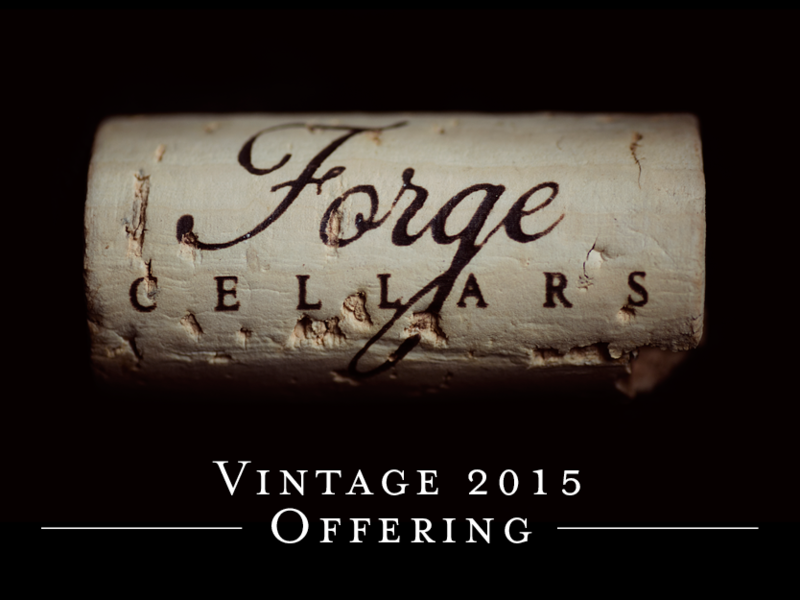 Fortunately, you have some 2014 Forge wines that are aging gracefully (you do, don’t you? ), and can always turn to this very complex vintage as a very suitable backup. Trust me, I am speaking from experience. I believe that for Justin, the patient one of the group, that the 2015 vintage was memorable because of the length of the fermentations. They were not complete (fermented to dryness) until well into the summer, hence the late release of the wines. Often I would ask him how fermentations were moving along, and the usual response was…”well, they are GOING…like a turtle." "One of the nicest aspects of our work is having a different vintage every year. A computer company has to invent all sorts of new products and develop many kinds of marketing strategies to keep the customers on board You know what? Mother Nature does that for us, and it is so creative that every vintage is different. Obviously, sometimes a vintage can “look like” another, but my experience is that all of them have their own identity. 2015 gives a great picture of this; we had never seen a vintage like 2015 and we won’t see it again. On a tasting point of view, it is so pleasurable when the mark of a vintage is obvious, it gives a great dimension of “time” to the wine. The terroir gives the dimension of “place”, of “origin.” What is important is to get an idea of truth. It is important that the wine is a translation of a reality, a story, a moment. So, as a grower it is important to make the best possible wine, but it is a bad way indeed to go “against” a vintage. This is why I like the 2015, because it has a lot of self identity and when we drink it in 15 years time, the way it will taste will have a “time machine effect” on us and it will make us happy." It will make us “happy”…this is indeed the 2015 vintage. 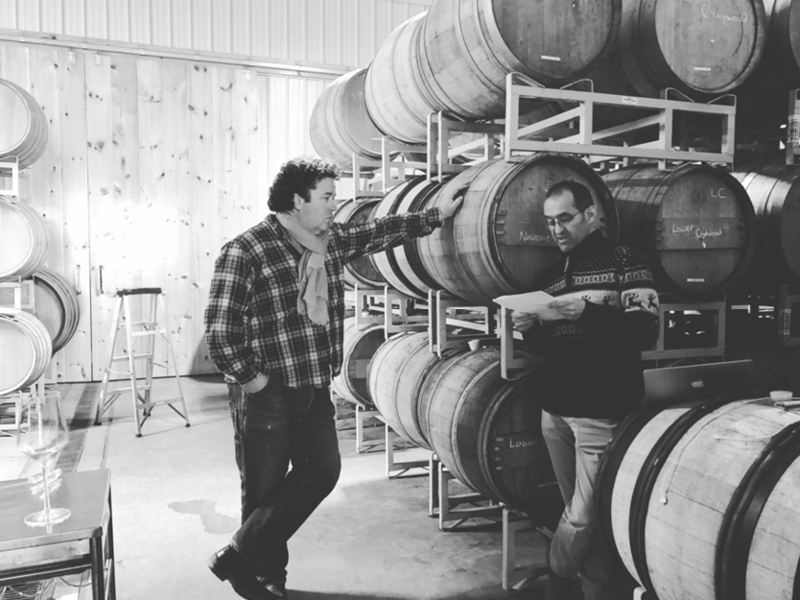 They are hedonistic, exotic, and unlike any of the wines we have had the pleasure of crafting before. Enjoy, be happy. 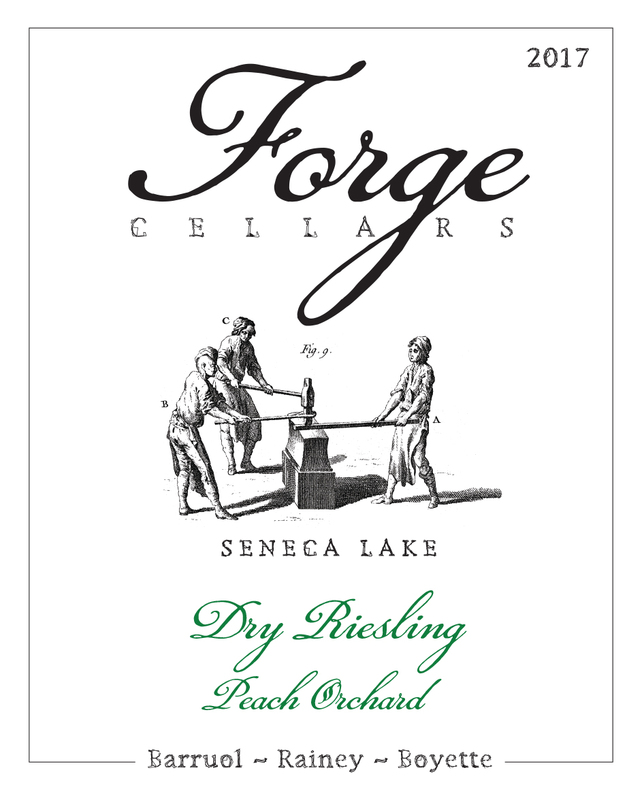 Our most important wine aims to reveal the true nature of the vintage and to explore the terroir of east Seneca Lake. Working with 8 different growers on 10 parcels, we see the depth of expression possible in a ripe vintage. With this level of ripeness, fermentations continued into late spring in order to finish bone dry. Quince, lemon, fennel and slate mingle with marzipan and white chocolate, supported by precise acidity. We consider this a “grand cru” site because of its close proximity to the lake and rocky terroir of shale near the surface. This vineyard always expresses its terroir clearly; grapes ripen early and well, yielding distinct character and power. The 2015 is savory and intense with flavors of stone and saline interplaying with apricot skin, apple and anise. These 40-year old vines are part of the original Charles Fournier plantings, planted on shale with minimal topsoil. Due to some extra-loving care throughout the growing season, this site produced dynamic flavors that deserved its own bottling. Lifted aromas of menthol, wild herbs and wasabi contrast sharply with a rich, lush palate of glazed apples, preserved lemon, raw honey and dried orchard fruits. We have come to expect great complexity and expression from well-farmed grapes on this site which lies in a slope contiguous to Leidenfrost. This vineyard is a jewel of the Finger Lakes where Riesling expresses itself with both minerality and ripeness year after year. A riper, heftier style that mixes dried apricot, dried apple and wild peach with honey, anise, ginger, white pepper and loam. Attractive mulled plums, violets, raspberry tea, truffle and charcoal aromas can be found on the nose. The ripe results of low yields in a warm growing season are evident in the density of this year’s Classique. Sweet plums, raspberries and pure cherry juice are spiced with cinnamon, cocoa powder and violets. Savory elements of underbrush and stone join the profile, staying focused and juicy on a long finish. This rosé of Pinot Noir is full-flavored and structured with notes of vibrant crunchy red cherry, cherry pit, thyme, and mineral. Produced using the saignée method, grapes were hand-harvested from Standing Stone Vineyard (located in Lodi on the east side of Seneca Lake) and experienced 16 hours of skin contact to retain its rich color. 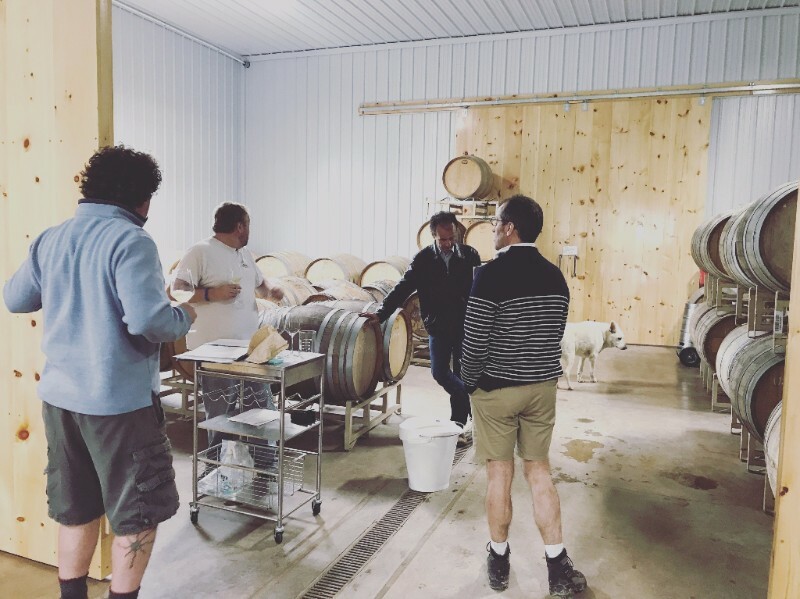 Jean-Baptiste, one of Louis' long-time friends and fellow French winemaker, came along for the ride, and experienced the Finger Lakes for the first time. What is truly remarkable about this region is that you don't have to go out of your way to introduce someone to this place and the people, it just happens organically. When an unknown person arrives in the Finger Lakes, there may as well be a line out the door of people waiting to introduce themselves and pass on one of their favorite local pastimes or watering holes. The community is woven so tightly here, which is one of the many reasons we love doing what we do, where we do it. Back to work... Although our rosé production is small—about 100 cases this vintage—it's a fun project for us, and was the first item on the agenda. We were all pleased to see it retain the intensity and expression of the 2015 vintage that we all loved so much. The next big task during Louis' visit was finalizing all of the cuvées: Classique, Les Alliés, and Single Vineyard wines. This means that each and every barrel and tank were tasted, ample notes were taken, blending trials were conducted, and after countless samples and discussion, the wines were realized. Every year it's fascinating to see the sometimes drastic differences between vineyards and terroir when tasting the wines. 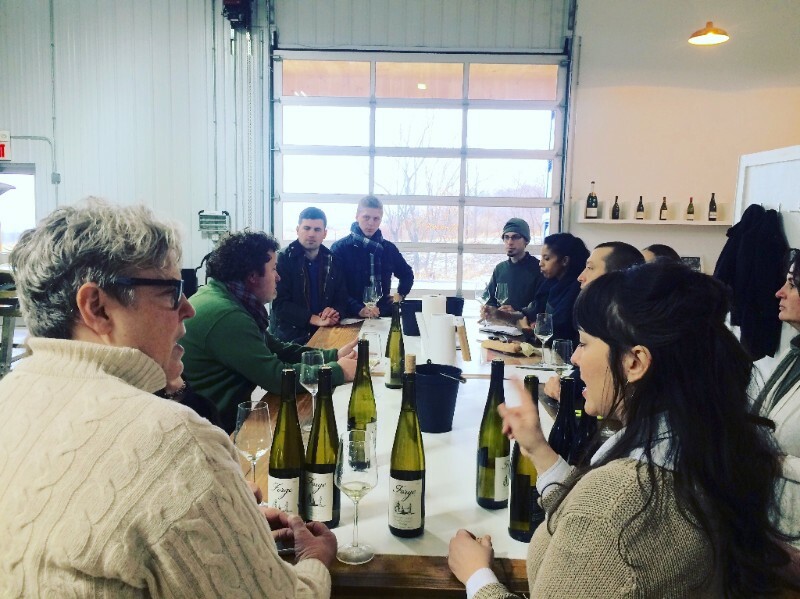 In our tasting of 2016 Rieslings, we noticed one powerful vineyard (you'll have to wait to find out which one...) that was so expressive, even adding 3% of it into our Classique bottling changed the entire dynamics of the wine. All-in-all, the wines from the 2016 vintage were full of character and finesse, wines that we are proud to be the first to have seen the entire winemaking process from start to finish in our new facility. It is important for us to constantly taste, to let our palates and our minds experience and understand the world of wine around us. Everyone on the team is encouraged to document the various wines that they try (especially Riesling and Pinot Noir), and share their impressions. The opportunity to taste together is always the most beneficial, and allows us to engage in lively discussion, analysis, and sometimes debate. It was a treat to taste some of the older vintages from Saint Cosme (2004 Les Deux Albion, anyone?) and sample Riesling and Pinot from around the world, each with their own story and personality. What did we do for play? Aside from taking pleasure in beautiful wines and the Michelin 3-star meals that Rick cooked up, we also wrangled in our bravery and jumped into one of many creeks feeding into Seneca Lake. Nothing is quite as invigorating at 9am as a chilly dip into a pool of fresh water (right, Louis?). We warmed up with a bonfire at the winery, had coffee and pastries, and shared some good laughs about the lunacy that just happened. These are the moments that remind us of how much we love what we do. 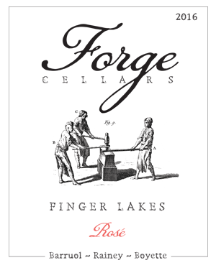 Having the team together, seeing our wines come to life before our eyes, and taking in all that the Finger Lakes has to offer (cold streams and all) is the life force of Forge. Our customer, Steven, from Seattle sent us this picture of freshly harvested Dungeness Crabs made into homemade crab cakes. The week before, Steven was telling me how he was out collecting oysters to go with another Forge Riesling. We love nothing more than seeing how you pair Forge Riesling with different foods from your neighborhood. The saline, oyster water, seaweed character of Harvest Ridge probably went really well with the sweet flavor of the Dungeness Crab. Wish I was there to experience it first hand! Please keep the pictures coming. A picture of Louis sharing Forge wines in Japan. On the right of the picture is our dear friend, Rudi de Pins of Château Montfaucon. A quick piece of advice -- if you are going to have partners in business make sure they are way cooler and more interesting then yourself! Last week Louis emailed me and said that his Norwegian importer tasted the 2015 Forge wines at St. Cosme and absolutely loved them. They placed a large order of Riesling AND Pinot, so we're very excited about that. Plus, the week before, Taiwan placed an order! While the rest of the team is hunkered down here in "the lakes" taking care of 2016 vintage, it is good to know that your partner is out in the rest of the world spreading Finger Lakes love.